Clenching to the bus rail on your way to work, you do not have both hands free to finish that Dead Trigger level you started last night. With a few minutes to spare, and one hand free, you need to find some games you can play with the same hand you are holding your phone with. Your choices are not as limited as you might think. You will find that most of the titles through the play store. This time we are also here with the same title, named “Rainbow Ball Challenge”. Rainbow Ball Challenge is the fast-paced action game for your Android to test your reflexes and color recognition skills. 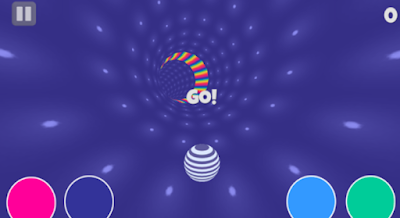 It features simple game play that is all about changing colors. Now the question is that how and why you will change the colors. Therefore, the answer is that in this game you will find a ball moving through twisted tunnels of different colors and to move through a that particular tunnel you must have to match the color of ball to the color of that tunnel by using your controls. · It offers clean and sleek user interface. · It features easy and understandable controls. · No internet required to play this game. · It is best for people from all age groups. · It will twist your brain and will give you a peaceful state of mind. · It comes up with 3D graphics and high definition sound effects. · It motivates you to beat your own score or challenge your friends. Avail all these exciting features today, free on your Android devices and have hours of unlimited fun. Direct download link to this game app is present at the end of this helping review.